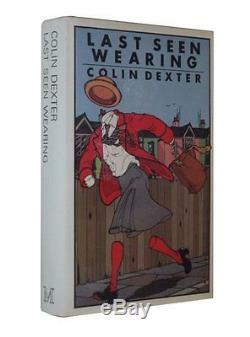 Dexter, Colin:'Last Seen Wearing' First UK Edition SIGNED. A first edition, first printing published by Macmillan in 1976. A very good book SIGNED by the Author to the title page. In a near fine unclipped wrapper (price blacked-out). The item "Colin Dexter'Last Seen Wearing' First UK Edition SIGNED" is in sale since Monday, June 8, 2015. This item is in the category "Books, Comics & Magazines\Fiction\Other Fiction". The seller is "jatkinsonbooks" and is located in Darlington, Durham. This item can be shipped worldwide.